As an RMT, Kim strongly believes that soft tissue manipulations can improve any pain cycle and compliment other health care professions. While staying positive, she likes to assist each individual patient to reach their health goals, at their pace, to accomplish the best version of themselves. 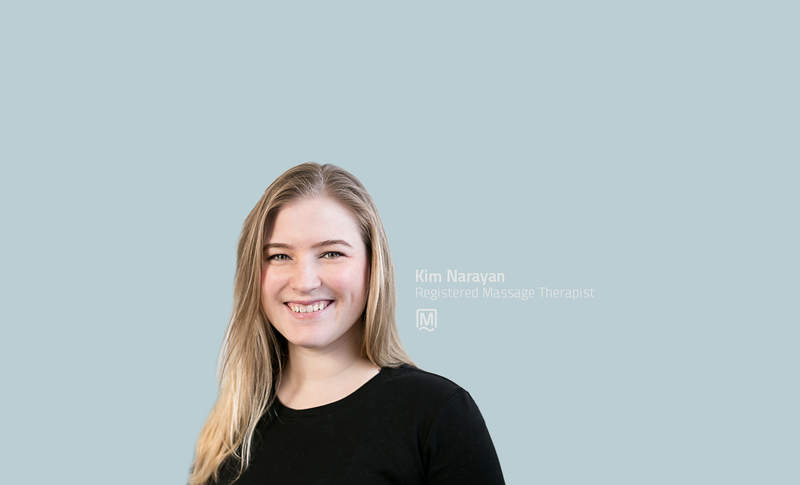 Being a registered massage therapist in BC means that Kim has certification of the highest industry standards in North America, and taught by some of the best in the industry. Kim has been fortunate enough to have exposure working with various populations such as elderly, pregnancy, and within hospital settings through her practicum. She was awarded first place for her case study research report on the effects of massage therapy with plantar fasciitis in 2014. She also has firsthand experience with the healing process and understand how painful and frustrating it can be. Kim is a true “Vancouverite”, being born and raised here; she enjoys watching the Canucks and BC Lions. Most of her childhood was spent participating in as many sports as she had time to, excelling in dance, while much of her summers were spent with family at Mission Raceway. Before becoming an RMT, she had been involved in the sport, health and fitness industry for over 15 years and also had experience as an administrator and fitness counselor. Coming from a very multi-cultural family, Kim enjoys working with people of diverse backgrounds and always welcomes new patients.